The steady lubricant layer between surfaces of two deformable bodies pressed to each other can be generated or as a result of movement of surfaces, or as a result of compulsory giving of lubricant in a gap between surfaces. In the first case lubricant moves together with surfaces and is involved in a gap. In the second case in contacting bodies there are special apertures through which lubricant moves under high pressure in a gap. If contacting surfaces do not move and there is no system of compulsory giving of lubricant in a gap direct contact of surfaces in some area which can be defined by the decision of a contact problem of the theory of elasticity takes place. At the moment of device start-up the surfaces of contacting bodies start moving, and under certain conditions between them the lubricant layer is formed. Now process of formation of lubricant layer at movement from a rest condition is a little investigated. At the same time most often the breakage of friction units occurs at the moment of its start-up and stop. It specifies that this problem has the big practical interest. A small amount of researches considered till now this process. In work  the experimental research of process of elastohydrodynamic film formation is spent in the contact of steel ball and glass disk covered with lubricant. The gap form between bodies was defined with split-hair accuracy and with speed of 1000 measurements of the form of a gap in a second. It is shown in this work that when movement begins, the majority of lubricant liquids forms front which extends in a direction of movement of surfaces with almost invariable form. 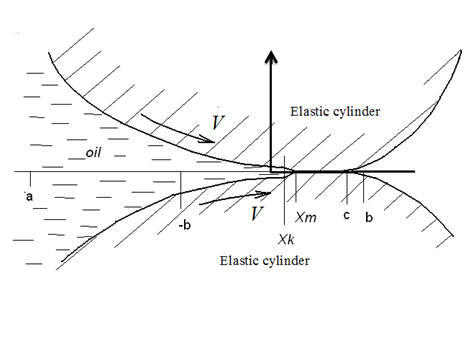 The mathematical model of process of formation of lubricant layer between elastic cylinders which start to rotate in the environment of lubricant from a condition of rest is here considered . The model assumes division of all zone of contact into three domains: domain in which the hydrodynamic theory of lubrication can be used, transitive domain and zone of dry contact. In the field of applicability of the hydrodynamic theory of lubrication the lubricant is modeled by compressed Newtonian liquid. The offered model of elastohydrodynamic film formation does not define the size of transitive domain. Working out of mathematical model of movement of lubricant in transitive domain is necessary for definition of this size. Here it is supposed that in transitive domain lubricant behaves as a rigid body. Results of calculations for lubricant which was used in experiments in work  are presented. At that the loading on cylinders was accepted such that the size of initial contact zone in dry contact of cylinders is close to diameter of initial dry contact zone of bodies in experiment. Results of calculations are presented during the same moments of time, as in work . Good coincidence of results of calculation and experimental results confirms suitability of the offered model of considered process at pure rolling. In case of pure sliding or rolling with sliding the choice another rheological model of lubricant is necessary. 1. Problem statement. Let till the moment of time cylinders do not move, are pressed to each other by force and contact in the domain which size is defined under the Hertz theory. We direct an axis along the general tangent to cylinders in a place of their contact. Let is half of width of contact zone of bodies till time moment . Let at the moment of time cylinders have uniformly accelerated motion and speeds of surfaces in a contact domain have the same direction. Cylinders rotate with uniformly accelerated motion until linear speed of surfaces will reach value . After that moment of time cylinders rotate with constant speed and linear speed of surfaces equals . As positive direction of an axis we choose direction of movement of surfaces in the contact region of bodies. When cylinders start to rotate, lubricant is tightened by moving surfaces in a narrowed gap, in domain in lubricant appears an elevated pressure, surfaces owing to deformations start to leave from each other in vicinity of point , the domain of dry contact of bodies starts to decrease. We designate co-ordinate of a boundary point between domain of dry contact and the domain occupied with lubricant layer, and - co-ordinate of other (outlet) boundary point of domain of dry contact of bodies (fig. 3.1). At the initial moment of time it is obviously that . With start of motion of surfaces the point moves to the right, and the domain is filled with lubricant. 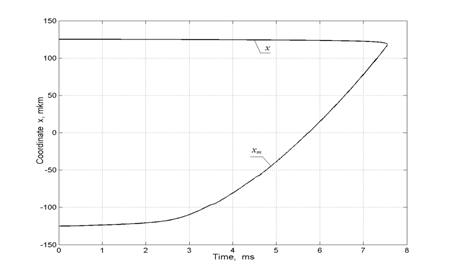 In the variants of calculation presented here the outlet boundary point of domain of dry contact moves towards to an entrance boundary point of area of dry contact. The Fig. 3.1 is represented taking into account the given fact. Let's formulate system of equations describing given process till the moment when surfaces cease to concern each other. After there will be a division of surfaces by a lubricant layer, a problem of definition of parameters of EHD contact can be solved by a method stated, for example, in . where is the speed of movement of border between domain of dry contact and domain of lubricated contact. Characteristics of the equation (3.1) are curves on a plane . Along characteristics as it follows from the equation (3.1), function remains to a constant. It follows from this that the equation (3.1) really describes lubricant movement in domain as movement of a rigid body. where is the rolling speed of surfaces of cylinders. The decision of the equation (3.2) is that lubricant moves in some vicinity of point as a rigid body with speed . However, speed of movement of lubricant in vicinity of point should coincide with speed of movement of the point that is the condition (3.1) is more exact in comparison with a condition (3.2). where is acceleration of surfaces, is film thickness, is the pressure developed in lubricant layer, are viscosity and lubricant density accordingly. Left part of expression (3.4) is equal to zero in a point , therefore for the contact of bodies take place it is necessary to demand equality to zero of the left part (3.4) in the domain . On the outlet border of domain where hydrodynamic theory of lubrication is applicable we accept a condition of continuity of pressure, i.e. Let's demand also that function is continuous at point , i.e. At the initial moment of time dry contact of bodies on segment is carried out. The pressure developed in domain, occupied with lubricant, and in the zone of dry contact, counterbalances the loading enclosed to cylinders, i.e. where the load is referred to unit of length of cylinders. where the gap during the zero moment of time is defined under the formula (3.8). Taking it into account the equation (3.4) together with expression (3.5) can be considered as one integral equation relative to in segment . If borders also are known, then, solving this integral equation, it would be possible to define function in segment . After that, using the received value of function in a point as a boundary condition for Reynolds's equation, it would be possible, solving EHD problem in the domain of , to define in this zone the functions and . Thus it is possible at known functions and to define functions and in all zone of a problem. However functions and are unknown, but for their definition there are conditions (3.7) and (3.9). That is these functions are necessary for choosing such that conditions (3.7) and (3.9) were satisfied. The pressure in lubricant layer, the lubricant film thickness and a lubricant stream that are the solution of a problem will be continuous functions in the domain uniting all three considered segments. Let's consider lubricant as the compressed viscous liquid which viscosity depends on pressure. For the account of dependence of viscosity from pressure we use model of Rolanda. Dependence of density of lubricant on pressure we accept in the form of (1.12), and dependence of viscosity on pressure - in the form of (1.19). 2. The analysis of results. 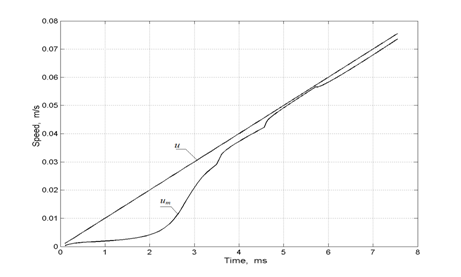 The calculations of movement of lubricant in a formed gap have been carried out at uniformly accelerated movement of cylinders from quiescent state. Parametres for calculations got out such that conditions in contact were as much as possible close to conditions in the experimental researches published in . In work  it was investigated rolling and sliding of a steel ball on covered with a layer of other material of a flat surface of a disk. The experiment spent in  with lubricant HVI 650 at pure rolling, temperature 80 ºС and acceleration has been for this purpose chosen. For the purpose of coincidence of theoretical and experimental conditions in contact the resulted radius and loading get out such that the next two conditions are satisfied. The first condition consists in that in the initial moment of time the width of zone of contact in cylindrical contact should equal to diameter of zone of contact in contact of a sphere to the flat surface used in experiment. The second condition consists in that in stationary mode of EHD lubrication at rolling speed theoretical and experimental thickness of a lubricant layer in the field of high pressure must coincide. Values of other parameters were accepted the same as in work . As a result there are used for calculations the following values of parameters: , , , , , , . Values of parameters are not presented in work . They are accepted by the following: , , that corresponds to the data available in the literature. Value of parameter is accepted . The results of calculations are presented below at value of parameter . On fig. 3.2 the dependences of lubrication film thickness on co-ordinate during the various moments of time are presented. The transitive zone is displayed on them in the form of front of lubricant liquid. Calculations show that at smaller value speed of front propagation above, i.e. surfaces leave from each other faster. However after a while after full separation of surfaces the thickness of lubricant layer practically does not depend on value of parameter . On fig. 3.3 the functions of distribution of dimensionless pressure during the various moments of time are presented. 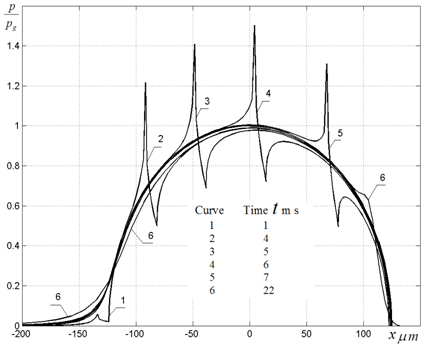 After a while after a cylinder start of motion on border between transitive area and area in which the equations of the hydrodynamic theory of lubrication are used, the pressure peak is formed. It is visible that on this border the pressure derivative has discontinuity. It is a consequence of that on the different parties of zone of contact the lubrication movement is described by different models and its properties on border have discontinuity. In model in which properties of lubricant will change continuously in all zone of presence of lubricant, the pressure derivative on their border also will be continuous. In transitive area pressure falls, and on border between transitive area and area of dry contact of bodies the pressure peak also is formed, but it is directed downwards. All process lasts 20 milliseconds. In first one millisecond the contact zone remains practically without changing. Pressure slightly increases in entrance area thus. During the first instants after starting of motion of surfaces the pressure growth is caused by rapprochement of surfaces in entrance area. At the same time the lubricant stream is directed in opposite direction of movement of surfaces. Further the velocity of stream of lubricant and velocity of movement of surfaces in entrance area in direction of normal to surfaces changes directions to an opposite directions, and pressure growth is caused by lubricant movement. At the moment of time there is a full separation of surfaces by lubricant. Further there is removal of surfaces from each other to value of thickness of lubricant layer which it has in a stationary mode. On fig. 3.4 the dependences of rolling speed of surfaces and speeds from time till the moment of detachment of surfaces from each other are presented. It is follow from this results that speed which it is possible to consider also as speed of movement of front of lubricant, in time initial stage is essential below speed . Further speed increases to the value close , but all period of time it remains below of value . On fig. 3.5 the dependences of co-ordinates of boundary points of zone of dry contact and from time are presented. It is visible that boundary points move towards each other, however, if the boundary point moves quickly the boundary point moves slowly. 3. 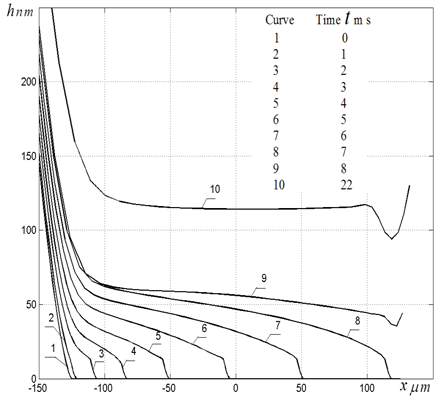 Usov P. P. Numerical аnаlуsis of transient processes in ЕHD contact of cylinders with varying direction of rolling velocity.-Journal of friction and wear, 2006 (27), N1, p.